It must have been a coincidence, but in retrospect the choice seems apt. The transatlantic flight heading towards Las Vegas' Consumer Electronics Show (CES) was screening the episode of 30 Rock in which Alec Baldwin's character tries to impress his new boss with a voice-controlled television. His demo is less than smooth. "What we have is some mute kids," says one of the on-screen characters - and the sound turns off. "Crap!" responds Mr Baldwin, and the set switches to "Keeping up with the Kardashians". Fast-forward to CES, and the newly unveiled smart TVs may have avoided this pitfall, but other limitations were apparent. Voice instructions were often misunderstood, or ignored altogether, if operators added an unapproved word to their commands. Gesture controls proved a fiddly way to select links on built-in web browsers, and could be accidentally triggered by a third-party in the room. In extreme cases error messages popped up and TVs had to be rebooted. But even if some of the bells and whistles still needed more tweaking, there was a sense that this year's trade show marked a turning point - TVs sets with the ability to stream online content and run apps appeared on their way to becoming the norm. 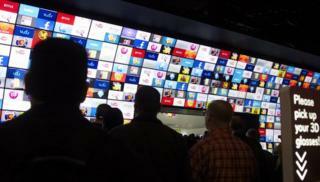 At the end of 2011 there were 82 million connected TVs in homes worldwide according to research group Informa. By 2016 it forecasts that number will have ballooned to 892 million. "There had been some early efforts - Samsung and other vendors putting apps on televisions," says Brian Blau from the tech analysis firm Gartner. "But this year we are seeing a real coming out party at CES where we can now sort of see the future of smart TVs, and I would even go so far as to call it version 1.0." For years much of the tech industry has pursued a vision of the computer as the home's digital hub. Owners used their PCs to copy photos off digital cameras, download music and movies and then transfer the material to other compatible devices. Advanced users might have connected their laptop to their TVs or streamed content to the sets wirelessly, but the televisions were at most at the end of a spur coming off the hub, rather than its heart. The roll-out of cloud services allied to faster internet speeds now offers televisions the chance to usurp the PC's place, and offers users further freedom from the confines of broadcasters' schedules. Samsung - the world's best-selling TV-maker - has been at the forefront of efforts to deliver this vision. One of the promotional videos it showed at this year's event claimed watching television by appointment would become a foreign concept in the future, and its executives talk of the TV being the centre of the home. "We call it more than a TV, and I think that's exactly the experience we're looking for, where you have a whole democratisation of content coming through," explains Andy Griffiths, managing director of Samsung UK and Ireland. "[It is] influencing the way people choose their content, manipulate their own content and personalise their own content. "If you put that under the banner of smart TV and what smart TV can deliver to you, it increasingly interfaces with some of the PC functionalities - but in fact it's about being a connected product. We see TV as being at the centre of that connected world." Users are offered thousands of apps allowing them to use social networks, play video games, run educational software and follow exercise routines. But smart TV makers recognise that people still want a sit-back rather than lean-forward experience most of the time. Furthermore they acknowledge that increasing numbers of homes own other connected devices. So users may still find it preferable to tweet about a show via their tablet or smartphone rather than shrink the TV picture to pull up an app alongside. However, manufacturers insist there are instances where it makes more sense to have everything on one screen. "Probably the best example is that you are watching live sport and a family member phones on Skype and you want to take the call but you still want to be watching the football," says Andrew Denham, Panasonic UK's marketing director. "You just mute the game, and you can have the interface with the loved one, and nobody's any the wiser that you are still watching the football - unless there is a goal score of course. "It's actually trying to make that multiscreen-in-one-environment work in a very effective way that's going to be a key to tiering it down, so that it is not just catch-up services that are popular but other applications." While Samsung and Panasonic are developing their own system software, Google is taking a second crack at offering its own smart TV service. At the show, LG and Vizio unveiled new sets with the search firm's Android-based software built in. Sony also added the facility to two devices - a set-top box and a Blu-ray player. The first version of Google TV launched in October 2010 to much fanfare, but proved a flop - enabled devices were criticised for being too expensive, and several TV networks blocked the US-only service from accessing their web content. This time round a focus on apps may tempt content providers to co-operate, but for now it remains reliant on its own YouTube service as well as streams from Netflix, Amazon and several niche operations. "I think it is more difficult for the web to come to TV than it was to smartphones for example," says Mario Queiroz, vice president of product management for Google TV. "TV content is of very high quality, high resolution and performance. "But what is happening is with the silicon and hardware technologies that we're seeing, the bandwidth coming into people's homes and with the advanced operating system that is Android, this is becoming a possibility. "There is heavy use of streaming services into people's homes today, and that's only going to increase." Google TV is due to expand to Europe this summer, but it will face competition from another third-party system. UK-based Canonical was punting a rival Linux-based Ubuntu operating system at the trade show. It says it offers a solution to clients who do not want to develop their own software and content deals, but feel uncomfortable linking up with Google. "[Manufacturers] want to make money after the device goes out, and often with a device running on Google, Google has so much power," said Peter Goodall, who manages product strategy at the firm. "We are a more flexible partner in that sense. We can help them integrate their own services so that they are still making money after the sale." Whichever operating system proves most popular, the internet poses a threat to the rest of the pay-TV market. Yet cable TV box-maker Tivo argues that it also presents an opportunity. The firm, which makes devices for Virgin Media in the UK, boasts that it is better positioned to offer an "elegant" service offering live, catch-up and pay-per-view shows, as well as programmes its devices select and record on their owner's behalf. Furthermore, it says that recent developments have spurred pay-TV providers on to furnish its boxes with more material. "It tends to light a fire under the operator world, who are quite concerned about the thrust of where companies [like Google] may want to go, which they consider highly disruptive to their relationship with their subscribers in the television space," says Tivo's chief executive Tom Rogers. "So the Google emphasis in the industry is actually something we have found helpful to galvanising more operators around our solution." Further evidence of Tivo's efforts to exploit, rather than be undermined by, Google came with its sole CES announcement - a remote control and content-finding app for Android devices. Lenovo, Toshiba, Sharp, Hisense and Haier were among several others launching new smart TV models at the Las Vegas event. However, despite all the innovation on show, many analysts appeared preoccupied by the one company without a booth - Apple. The firm's strength in the online music industry, its Siri natural speech recognition facility and a hint of having "cracked it" in the recent Steve Jobs biography, have all combined to create an as yet unjustified sense that the iPhone giant is about to disrupt the television market. However, it may be Microsoft that deserves closer scrutiny. In an otherwise news-light presentation, chief executive Steve Ballmer revealed that its XBox Live online service now had more than 40 million subscribers. He added that increasing numbers of these owners were using their consoles to watch live TV, on-demand programming, news and movies. The firm already offers UK users access to content from Sky, Amazon's Lovefilm, YouTube and 4 on Demand among others, and US users were promised additional content from News Corp's Fox TV channels. "People don't know them as a TV interface, but if you are a gamer you clearly understand the value of that, especially if you have the Kinect accessory," said Gartner's Brian Blau. "Its voice and gesture controls in combination with its handheld controller and new Metro user interface are starting to gel with the XBox 360." According to Reuters, Microsoft had planned to go further andunveil its own TV and movie subscription service, but baulked at the fees media companies demanded. However, analysts expect the firm to offer an even smoother TV browsing interface when it releases its next generation games console - possibly as early as the E3 games conference in June. For now, the smart TV market looks fragmented from the point of view of content, and immature in terms of some of the technologies involved. But as smart TVs become ever smarter, previous generations of unconnected sets may soon appear only slightly less antiquated than the black-and-white models of yesteryear.